We know that young Arthur was one of the first to volunteer for military service when war broke out in 1914, and that he died in action on 15 September 1916, when he was 22. Hutson has no known grave and is commemorated on the memorial to the missing of the Somme at Thiepval, but not on the War memorial at Stockwell. This may not have been an oversight by the committee who compiled the list of 574 names on the memorial. It was not unknown for bereaved families to turn their backs on the business of Remembrance, either in anger at the authorities or because they did not or could not face their feelings of loss. Sometimes people simply moved out of the area and missed the call for names. A few possible clues to Hutson’s life? Hutson is not a name uncommon in Vauxhall. For many years there was family butcher, Head & Hutson, on the Clapham Road at Oval Tube Station, their glorious sausages much missed. Given that that Rifleman Hutson served with 1/6th Battalion London Regiment (City of London Rifles) and died on 15 September 1916 it is likely that that the Hutsons lost their only boy in the infantry assault upon High Wood, a German strongpoint on the Somme. The City of London Rifles were a volunteer regiment, once nicknamed ‘the Printers’ Battalion’. That Rifleman Hutson may have had ink in his veins is suggested by a passage in page 2 of a three-page letter by Hutson which speaks of ‘when I was a budding journalist of 19’. That would have been 1913/4; did young Arthur try his luck with the South London Press? Where Hankey and Hutson met is unclear, but it may have been when both men were in England recuperating from wounds, which would be late 1915 or early 1916. 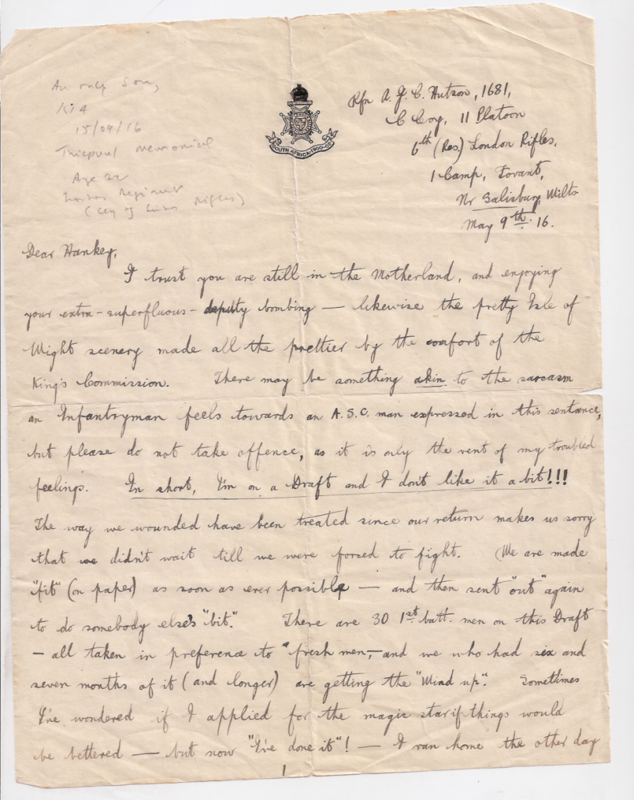 Hutson’s letter was written from a training camp on Salisbury Plain, a last stop before return to the Front. By May, Hankey – now a best-selling author, widely-read by soldiers and civilians alike – was corresponding with fellow-solders. Hankey had long been passed fit and, although keen to fight, had been kept back to drill men like Hutson in camp on the Isle of Wight. The two may have met there. Hankey’s duties on the IoW could be as dangerous as serving the front line, Hutson’s mention of ‘bombing’ in line 2 of page 1 being a reference to Hankey’s spell as grenade instructor. Hutson also writes of ‘running home’ (going absent without leave) for four days.2 Hankey wrote feelingly about the Army’s maltreatment of wounded civilian soldiers such as Hutson. Although lionised in the press, sick and injured men were routinely denied home visits. Hutson tells Hankey that he has lived to regret volunteering instead of waiting to be conscripted. Now recovered from his injuries, Hutson rails at being ‘on a Draft’ (waiting to be sent back to the Front). His was a common complaint, that wounded men were hastily patched up, drilled and thrown back into the fight instead of troops on cushy duties in England. In May 1916, however, the British were gearing up for the great offensive on the Somme which began in the last week of June and petered bloodily out that winter. By then, both men were dead, killed within a few miles of each other, Hutson on 15 September – probably at High Wood – and Hankey, then 31, on 12 October in the assault upon Lesboeufs. Like Hutson, Hankey’s name is also inscribed upon the Thiepval memorial to the missing of the Somme. He is remembered for his social work in pre-war Bermondsey by Hankey House, Hankey Gardens, Hankey Place, as well as upon the war memorial in the Oxford & Bermondsey Club in Webb Street. 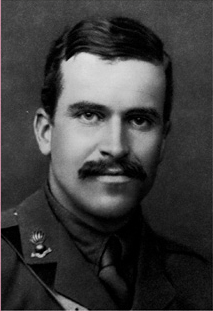 Like Hutson, Hankey, author of the best-selling A Student in Arms, was also one of the ‘First Hundred Thousand’ volunteers who answered Earl Kitchener’s call to arms. 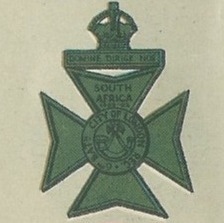 Hankey was invalided home from France in August 1915 and, passed fit, reported for duty in France on 22 May 1916. ‘Philip Johnstone’ published ‘High Wood’, an eerily prophetic poem about battlefield tourism in the Daily News in June 1916. ‘Johnstone’ is thought to have been Great War soldier John Stanley Purvis. By reason of its High commanding site. (They soon fall in), used later as a grave. A large variety, all guaranteed. The tunic having lately rotten off. Refreshments at a reasonable rate. There are waste-paper baskets at the gate. Ross Davies, A Student in Arms: Donald Hankey and Edwardian Society at War. Routledge, 2014. In ‘Heroes and Heroics’, The Spectator, 25 March 1916, reprinted in A Student in Arms, series one, first published London, May 1916).